Express on Friday, according to India's Railway Minister. 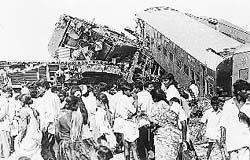 The accident occurred at about 0315 on 4 June 1999 near Kazipet between Ippuguda and Ghanpur. The train was travelling at about 95 km/h when the driver noticed an unusual noise and applied the brakes. Fourteen carriages derailed, five of which overturned. A number of the coaches rode over and crushed a first-class, air-conditioned coach marshalled at the front of the train. According to press reports in India 8 people were killed in the derailment. Earlier reports had indicated that there had been as many as fourteen deaths. A further 60 people were injured. Among the dead was the Education Minister for Andhra Pradesh - Devineni Venkataramana. It was in 1st Class AC coach that all the deaths and the most serious injuries occurred. The damage to the carriage was so severe that only 3 bodies could be recovered immediately. Rescue workers using flame-cutting tools finally reached the remaining five bodies in the late evening.